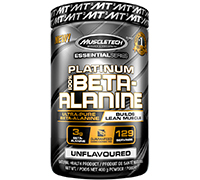 Each serving of Platinum 100% Beta-Alanine provides a precise dose of beta-alanine and L-histidine shown to promote muscle protein synthesis. What’s more, this ultra-pure beta- alanine powder has been shown to build lean muscle in conjunction with a regular training program and a healthy diet. Platinum 100% Beta-Alanine is completely free of stimulants – it can be taken on its own, stacked with other MuscleTech® Essential Series products, or combined with your favourite pre-workout to power you through your toughest training sessions.